We’ve just added 3 MORE CUSHION DESIGNS to the ZIVA CASA Cushion Collection…..
Also OUR CHARTS ARE NOW READY TO ORDER for our bracelets and cases! PLUS A SNEAK PREVIEW OF NEW EXCITING DESIGNS COMING SOON……. 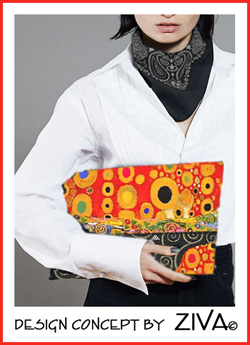 CLUTCH BAGS INSPIRED BY ARTIST GUSTAV KLIMT! Gustav Klimt also inspired our free eye-catching MIRROR/COMPACT/MAKEUP CASE design for your purse … our latest free design! You will also learn a new stitch….. the CHAIN STITCH. 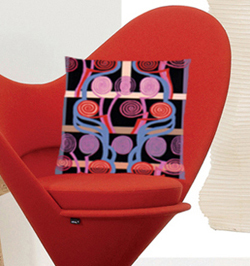 We have adapted one of Charles Rennie Mackintosh’s 1920’s pencil and watercolour sketches for a textile motif to create this dynamic, bold cushion design… ‘Mackintosh Spirals’ . It sits dramatically on the Heart Chair by Vernor Panton designed in the 1950’s! proof that good design endures! 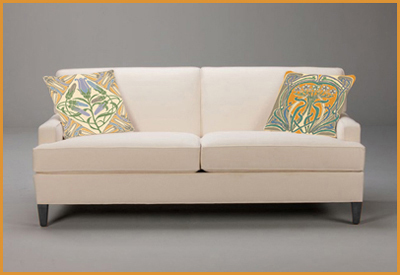 We are presenting two new art nouveau cushion designs with spring flower motifs, “Spring Buds” and “Spring Jonquils” . Perfect designs to help us forget all about winter and celebrate spring! Although different patterns, they complement each other beautifully in style and colour. I had a great time studying Gustav Klimt's paintings and textiles when creating this newsletter's Free Design. So I decided to keep going and create two bold Clutch Bag designs…. my homage to Klimt! These dynamic designs will be released on the site in the summer of 2015! Hope you like them! 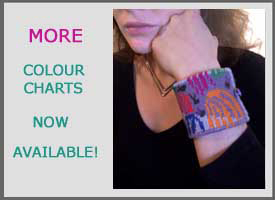 Colour Grid Charts for four bracelets and four small cases are now available! Go Shopping for Needlepoint Charts! 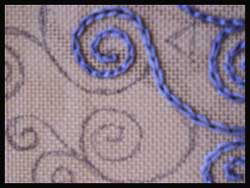 The Chain Stitch is one of embroidery’s basic stitches that all beginners are taught in traditional embroidery. But we’re giving it a modern twist…. 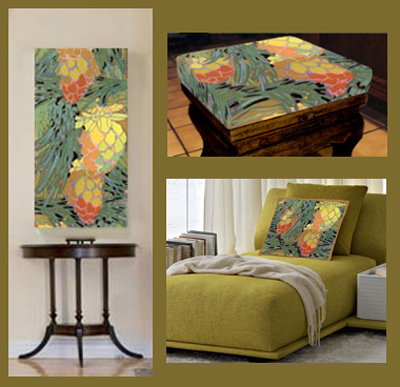 by using it to create Gustav Klimt’s flowing Modernist spirals! Re-insert the needle at 1, pass it under 2 or 3 threads of canvas, and bring it up at 2, holding the looped thread below the point of the needle. 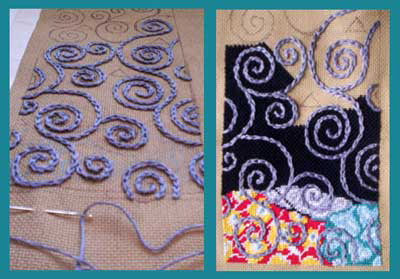 To finish a row, make a little stitch over 1 thread just outside the final loop. Keep practicing following the sequence of stitching in the charts until you feel confident. MAKE SURE YOU PRACTICE CURVES AND SPIRALS! Then you are ready to stitch the free design. I wanted to develop a free needlepoint design based on Gustav Klimt’s spirals and also integrate some of his other textile designs to create a layered textural effect customary in most of his paintings. BUT I WANTED TO UPDATE IT TOO! 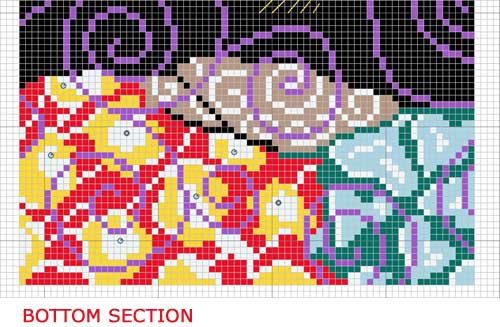 That means accenting a mix of Klimt’s patterns asymmetrically at one end of the tapestry only, and featuring the spirals throughout to create a more minimalist effect. 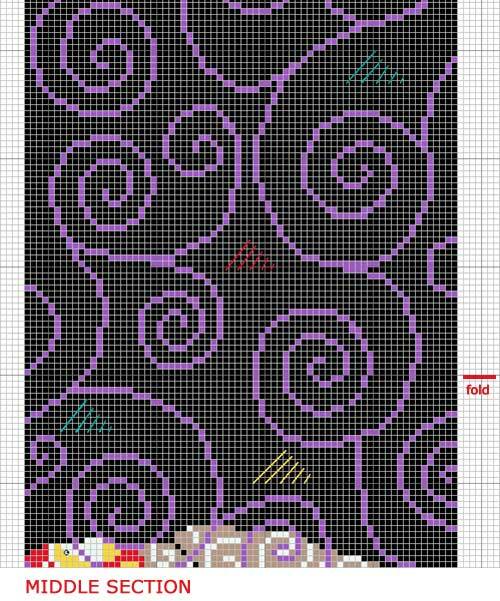 The colours have also been updated … the primary colours in the multi-pattern section are offset with cool grey spirals on a black background. A PERFECT ACCESSORY FOR YOUR HANDBAG! Voila! A dynamic case design that can be made up in two sizes depending how you fold it…. … fold it once (photo above left) for a larger case (approx. 4” x 5.5” [10 x 14 cm] for makeup brushes and pencils, or for a few pieces of jewellery for that week-end getaway! The entire design can be stitched in the Tent Stitch if you want. GOBELIN STITCH for the optional multi-coloured triangles. NOTE: These two stitches have featured in our previous newsletters. All colours for the Klimt’s Chains case design are chosen from DMC 25 Mouliné Special 100% cotton yarns. Start by marking the outline of the case on the canvas with a pencil or WATERPROOF pen. The size is 4” x 11” (10 x 28 cm) or 72 x 198 threads on 18 gauge canvas. 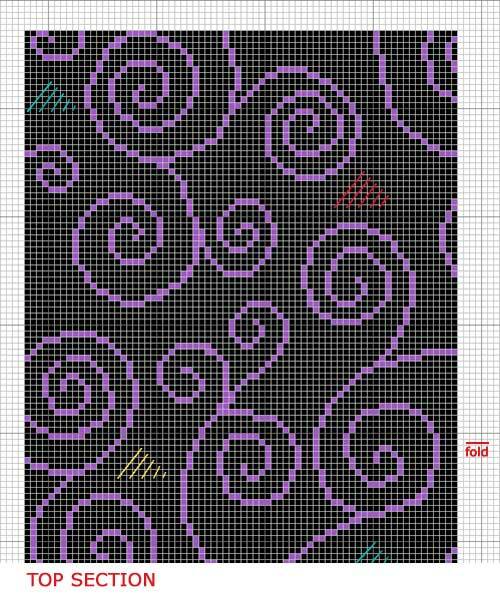 Because all the spirals are stitched in the Chain Stitch, counting each stitch on the chart to create a spiral would be mind-numbing! My advice would be to use the chart as a reference and plot two or three points on a spiral and then draw the shape freehand with a pencil right onto the canvas as shown in the photo at right. A lot more creative and fun than laboriously plotting each stitch! Stitch the Chain Stitch entirely first as shown above left. Then fill around the chain stitch with the colourful pattern in the Tent Stitch and the black background in the Brick Stitch as shown in photo above right. Add the multi-coloured triangles in the Gobelin Stitch last. Only basic sewing skills are required! You should first trim the completed tapestry allowing an approx. ½” seam allowance and cut a piece of lining to the same size, and sew together. You can fold the case twice at the approximate lines shown on the chart. The multi-coloured bottom section of the chart is the case flap. This flap should be about 3” (7.5 cm) deep, so that approximately an inch of black background appears at bottom of the made-up case. Sew the side seams together and add Velcro (or a magnetic closure) for the flap. You can also add side gussets to the case to make it deeper if you choose. Fold the tapestry in half to create a slightly larger case, sew the seams together leaving an opening at the end or side, depending how you’re going to use it. Insert a zipper, or snap or Velcro at the opening. Again side gussets would give the case more depth, to hold thicker objects. You now have a versatile, handy case for you handbag! Of course! That’s what ZIVA is all about! We can adapt most of the patterns on the site to be used in a different way. We do it all the time. For example, we’ve taken area rug designs and reworked them into piano benches, or cushion designs into footstools patterns, etc. Give me an idea which pattern(s) you prefer and the size of handbag you want. If you have a particular shape in mind, that would also be helpful. We can then develop a few alternate ideas and send them to you in graphic form, for you to choose from. I’m looking forward to working with you! The next VIVA ZIVA! Newsletter #1518 will be issued in the fall of 2015.